The Bullpup was the first successful guided tactical air-to-ground missile of the U.S. Navy and the USAF. Although it had severe limitations, it was produced in very large numbers. Development of the Bullpup was initiated by the U.S. Navy in 1953, when an operational requirement was issued for a short-range air-to-ground guided missile. The two primary goals were to give the ground-attack aircraft a standoff missile to avoid prolonged exposure to enemy groundfire, and to increase the chances of destroying targets which are hard to hit with free-fall bombs (like e.g. bridges). The design competition was won by Martin, and in April 1954, the company received the contract to develop and produce the new missile, designated ASM-N-7 Bullpup. It was a relatively small missile with a 113 kg (250 lb) warhead, which was optically tracked and manually guided by the pilot. The first successful air launch of an XASM-N-7 prototype occurred in June 1955, followed by YASM-N-7 evaluation models. In April 1959, the ASM-N-7 Bullpup production version entered U.S. Navy fleet service. The majority of the production missiles was built by Maxson Electronics. The ASM-N-7 was a roll-stabilized missile, powered by an Aerojet MK 8 solid-fuel rocket motor, and with a simple derivative of a standard 113 kg (250 lb) bomb as warhead. After visual identification of the target, the pilot launched the missile, and used two small flares at the back of the missile to track its flightpath. Using a small control stick to transmit radio commands to the Bullpup, he manually guided the missile to its target. This system was extremely simple, and therefore the Bullpup could be used with almost every aircraft, even including Sikorsky HUS-1 (UH-34D) helicopters. Of course, this simple manual guidance principle also had severe drawbacks, the main one being that the aircraft, the missile, and the target essentially had to remain in a straight line during guidance, making the aircraft vulnerable to ground fire (and thereby somewhat negating one of the original reasons for using missiles instead of bombs). The radio command equipment in the launching aircraft was usually an AN/ARW-73 or AN/ARW-77 system. There was also a completely inert handling practice variant of the ASM-N-7, designated as TASM-N-7. After tests with YASM-N-7a missiles, the improved ASM-N-7a Bullpup A was introduced in 1960. It replaced the solid-fuel motor with a Thiokol (Reaction Motors) LR58-RM-4 liquid-fueled rocket engine with storable propellants, increasing the range of the missile. The 113 kg (250 lb) warhead was also improved. The ASM-N-7b Bullpup B was a significantly enlarged version. It had a 453 kg (1000 lb) warhead in a larger body section, enlarged wings, and a new Thiokol LR62-RM-2/4 rocket engine of much higher thrust. It was first tested in 1962, and became operational in 1964. The new motor gave the ASM-N-7b a still larger dynamic range, but because of the visual guidance system, effective range remained essentially the same. The Bullpup B was eventually also used by the USAF. U.S. Air Force involvement in Bullpup development began around 1955, when the USAF contracted Martin to develop an advanced derivative of Bullpup, designated GAM-79 White Lance. It was to use a Thiokol LR44-RM-2 storable liquid-fuel rocket engine, and was to have a nuclear warhead option. Another new feature of the GAM-79 was an improved radio command guidance, which no longer required the aircraft, missile and target to be permanently in line during guided flight. This allowed the pilot to fly evasive manouevers with his aircraft and the missile. Because the development of the White Lance would need some time, the USAF decided to procure the unmodified ASM-N-7 Bullpup as an interim missile, with the designation GAM-83. 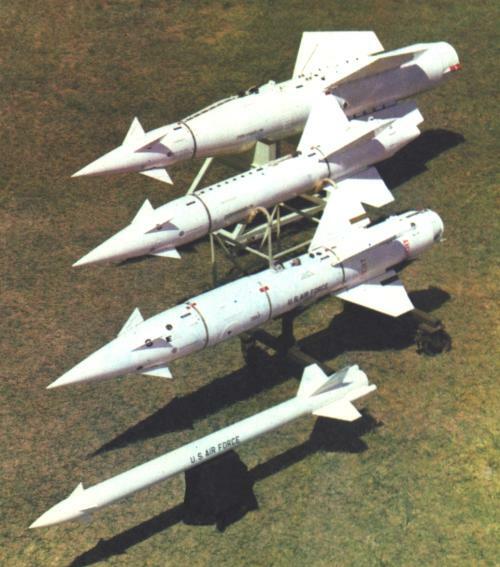 The GAM-79 White Lance missile was gradually merged into ongoing Bullpup development, and the result was a missile, which was essentially the same as the U.S. Navy's ASM-N-7a Bullpup A, with the exception of the improved guidance system. The GAM-79 designation and White Lance name were therefore dropped, and the missile became the GAM-83A Bullpup. The GAM-83B was a derivative of the GAM-83A with a body section of slightly larger diameter, which could optionally be fitted with a 1-15 kT W-45 nuclear fission warhead. For Bullpup training, Martin developed a modified 12.7 cm (5 in) rocket with tracking flares and radio command receiver. This rocket was designated as TGAM-83 by the USAF. The redesignation included two irregularities. First, the use of the AGM-12B designator for two non-identical Navy and USAF versions was at least confusing. Second, the assignment of the plain ATM-12 designator without a suffix letter was against the rules which required suffixes for all versions. Some AGM-12A/B/D missiles were later converted to inert training rounds and designated ATM-12A/B/D. The final production Bullpup version was the USAF's AGM-12E. This variant was a derivative of the AGM-12C, in which the unitary warhead was replaced by an anti-personnel cluster bomb warhead with 800-830 BLU-26/B bomblets. 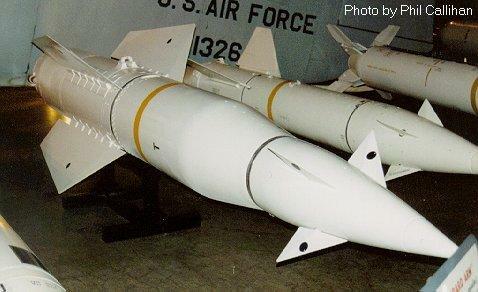 The AGM-12E was intended for use against anti-aircraft sites in Vietnam, but was produced in very limited numbers only. The AGM-12 was used by both the U.S. Navy and the USAF in Vietnam, but because of the missile's inherent limitations, it's not surprising that the overall results were disappointing. However, because of the large numbers built until production ceased in 1969, the AGM-12 remained in U.S. service for some time, and while phase-out began in the mid-1970s, the last AGM-12Cs were not retired until the early 1980s. In total, more than 30000 Bullpup missiles of all versions have been built, most of these as AGM-12A/B (only about 4600 AGM-12C and 800 AGM-12E are included in the total). The majority of the production missiles were built by Maxson Electronics under subcontract from Martin Marietta. Maxson is also attributed with a version designated AEM-12F. I have no firm details about this variant, but there are indications that it was a missile which had jamming equipment instead of a warhead. There were several projects which sought to improve the Bullpup by replacing the manual guidance by some sort of autonomous guidance system. These efforts resulted in the experimental derivatives AGM-79 Blue Eye, AGM-80 Viper, and AGM-83 Bulldog.